The decorative, stylised quality of this work reflects Goncharova’s interest in the folk arts and religious icons of her native Russia. While contemporaries were looking to so-called ‘primitive’ art beyond Europe, Goncharova celebrated Russia’s indigenous culture. She explained: ‘If I extol the art of my country, then it is because I think that it ... should occupy a more honourable place than it has done hitherto.’ This work is typical of her depictions of peasant life and was made around the time of her stay on a family estate in rural Russia. The artist said that this is a picture which she did not wish to sell because it represents the happiest time of her life, the two summers she spent at the linen factory in the Kaluga district on the estate which belonged to her cousins, with the grandmother she adored. The house stood on a raised terrace and there was a pond below used for washing and bleaching linen. At that time there was also a large paper factory, for high quality paper made of rags. Larionov thought that this picture should be dated c.1906-7, but Gontcharova believed that 1908-9 was correct. A similar picture of women planting potatoes was reproduced by Eganbury, op. cit., as 'Planting Potatoes' 1908; another of women picking apples was in the 1961 Arts Council exhibition (91, repr.). Although T00468 is now entitled on the back 'Spring: Gardening', it was probably the picture exhibited as 'Gardening' in Moscow in 1913 and listed by Eganbury among her paintings of 1908. No.424 in the 1913 exhibition was 'Planting Potatoes' and no.425 'Picking Apples' (probably the other two pictures referred to); 'Gardening' was the immediately following item, no.426. Though the three pictures are very close in style and theme, they are all slightly different in size. 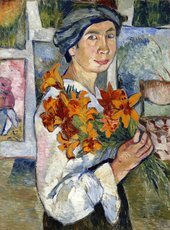 The summer of 1908 spent in the Kaluga district was a revelation for Gontcharova of rural Russia and completely transformed her work. It was then that she began to paint scenes of peasants working. T00468 has the sketchy beginnings of a landscape with trees on the back. This was afterwards partly obscured by a thin wash of white, and the inscription was written on top.